City Dock is a cozy and friendly establishment in downtown Annapolis, MD. It was evident from the moment I walked in City Dock that therein lies a seriousness when it comes to coffee, tea and it’s customers. I have to say that the cashier was one of the friendliest around. He carefully went through the menu and explained all of the drinks that I had questions about. After this tutorial on “ All things City Docks” I carefully placed my order. I had a lightly sweetened Iced Almond Joy and a Strawberry Scone. As I sat down in this cozy coffee house I quickly noticed the barista behind the scenes. This young lady was completely focused of what makes a good cup of espresso! I watched her as she made many drinks and she never took her eyes off the prize! I am convinced that her careful attention to detail is what makes the City Dock House one of the best. My drink was perfect in every way! Not too Sweet. Smooth. Creamy. I enjoyed every bit. The Scone was extremely moist and also lightly sweetened. It was one of the best coffee experiences that I have encountered. Do yourself a favor. Stop by City Dock. It will be worth the trip. 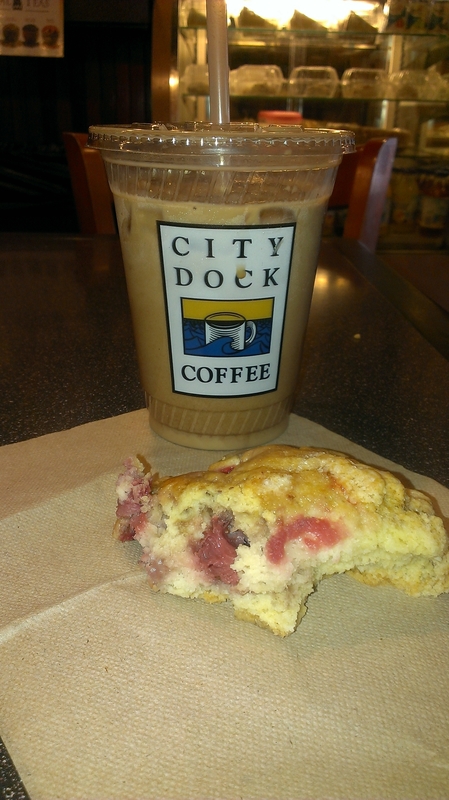 Categories: Uncategorized | Tags: Annapolis MD, City Dock, coffee, espresso, Iced Almond Joy, scones | Permalink.